Every year for our anniversary, my mom sends us a card and/or a gift. And every year I tell her she doesn’t need to do that. But she insists. Since 2011 marks our 5th anniversary, she wanted to get us something bigger. She surprised us at the holidays with our early anniversary gift – a beautiful LeCreuset dutch oven! Of course, I instantly started obsessing about what I would make in the dutch oven first. When we got home with it, I read the instruction booklet first. I was surprised to find that the plastic knob is only oven safe to 375. That doesn’t seem like a very high temp, so I went on Amazon and instantly ordered this stainless steel knob so I won’t have to worry about the black one melting or exploding in the oven. Once I got all of that taken care of, I scoured my Google Reader for recipes. 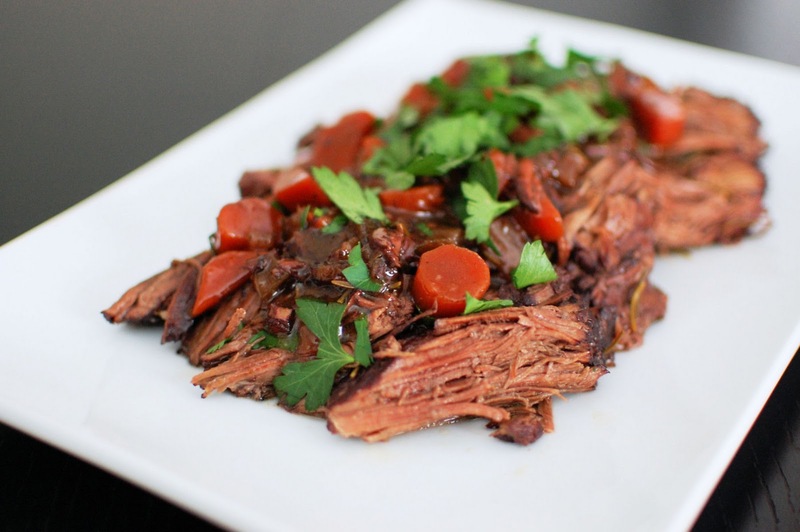 I decided on this Beef Braised in Wine. 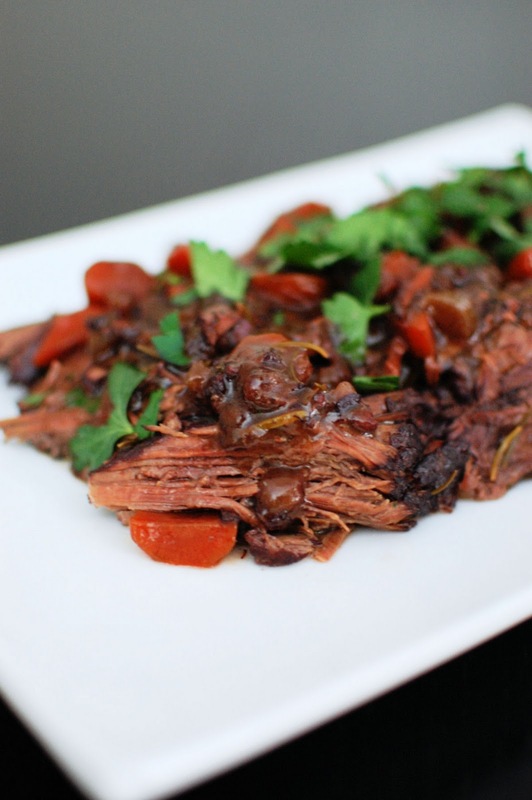 Cooking some beef in red wine for four hours couldn’t possibly have bad results. I made this on a chilly Sunday morning while Hubby was out snowboarding. It smelled so good cooking away and after three hours, my big hunk of beef broke into three pieces. By four hours, all of the meat had completely fallen apart. The sauce adds a very complex flavor profile to the beef (check out how much it reduced in the picture below). My favorite bites were the ones with a chunk of carrot, some beef, and lots of the thick gravy. YUM! 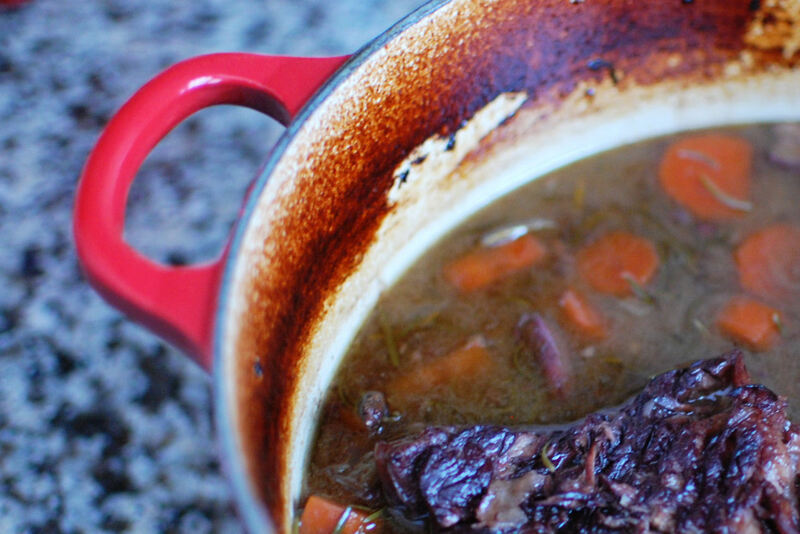 This is a hearty meal that’s perfect at this time of year. While it only makes 6 servings, it’s worth the effort. I used a cabernet savignon for this recipe. We enjoyed that there was some wine left to drink after making this meal! I served this with some sauteed green beans. I changed the recipe a bit to increase the amount veggies so we had nice chunks of veggies in our sauce at the end. I also added a slurry made of cornstarch to the sauce at the end to thicken it up even more. Those changes are reflected in the recipe below. In a large Dutch oven, heat the oil over medium-high heat. Sprinkle the beef with salt and pepper. Add the beef to the pot and cook, turning every 2-3 minutes, to brown on all sides. Remove from the pan. To the fat in the pan, add the pancetta and cook until browned, about 3 minutes. 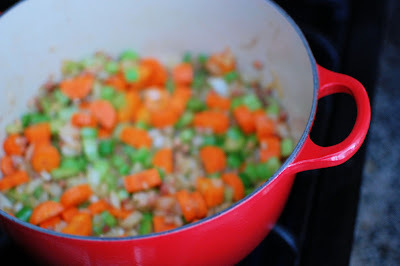 Add the onions, carrots, celery and a pinch of salt; cook until caramelized, about 15 minutes. Add the garlic and cook until fragrant, about 30 seconds. Return the beef to the pan and add the wine, 2 cups of the stock, rosemary, bay leaves and cinnamon stick. Bring the liquid to a simmer over medium-high heat, then cover tightly and transfer the pot to oven. Cook, turning the roast every 30 minutes, until fully tender and a meat is starting to fall apart when poked with a fork (3 1/2-4 hours). Remove the meat from the pan and tent with foil to keep warm. Remove the rosemary, bay leaves, and cinnamon stick, and place the pot over high heat. Cook about 10 minutes. Ladle about 1/2 cup of the hot sauce into a small bowl. Whisk the cornstarch into the hot sauce then add slurry back into the sauce in the pan. Cook another 10 minutes until the sauce has thickened a bit. Adjust the seasoning to taste and turn the heat off. Place meat onto a platter. If it has not completely fallen apart, thinly slice the beef across the grain into 1/4-inch thick slices. Serve the beef ladled with the sauce. Garnish with parsley and serve. What a great idea! And what a great friend you are! I can’t believe the timing on this – friends of ours just went into the hospital to have their baby about two hours ago! About a week ago I cooked and froze a Stuffed Pepper Casserole and a loaf of Zucchini Bread in anticipation of their bundle of joy, but I am loving this idea way better! I may try to do this instead. Thanks for the idea! These are absolutely fantastic ideas. Thanks for sharing them. using distinctive means for achieving the corresponding purpose. you also truly consider the connectability of this product.